It’s about time I just admitted it: I have an addiction to buying food. Not dooms day bulk canned goods or obsessive coupon clipping-type offenses, and certainly not everyday stuff like apples or yogurt, but obscure, foreign, even weird ingredients. My absolute favorites are the kind where none of the writing on the label is in English and the country of origin doesn’t require nutrition facts panels, with maybe only a picture of an obscure fruit dish to offer any clue as to what to do with it. Never seen it? Look cool? It’s going in tonight’s dinner. Makes me feel alive, risqué if you will. There’s the Chinese dried mushrooms, bulk chiles of all sizes, packages of seaweed (I think its seaweed anyways), dried various colored beans and cans of tropical fruits (young green jackfruit? Yes please!). Spices and condiments are probably my most frequent indulgences; from the huge jar of shawarma spices that I could only finish if I opened a gyro hut out of the garage, and oily red shrimp paste, to jars of curry paste every color of the rainbow; I just can’t help myself! Last weekend I went on a binge at HT Market, my favorite ethnic grocery in north Seattle. The Asian noodle aisle always smells a little too ripe (what is rotting in the dry goods section?) and I’ve actually seen moldy cojita cheese for sale (marked down to just 99 cents! ), but that’s part of what makes a trip there so entertaining. What really keeps me coming back though is the endless selection of international ingredients to feed my habit. This tub of “mild Korean soybean paste”, called doenjang, was the result of a recent binge. Traditionally used as a seasoning in soups, stews, and vegetable dishes, this highly flavored condiment is actually quite nutrient dense. 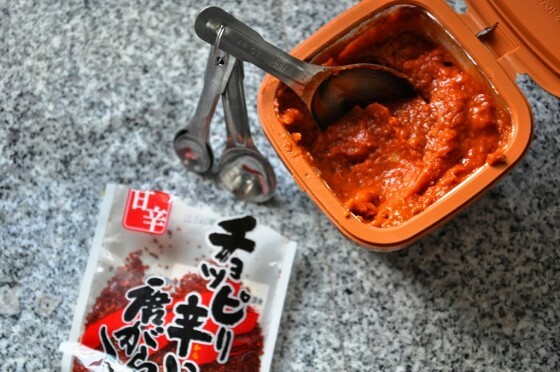 The fermentation process renders crushed soybeans into a thick paste rich in vitamins, minerals and savory umami-rich flavor, like a chunkier version of miso. 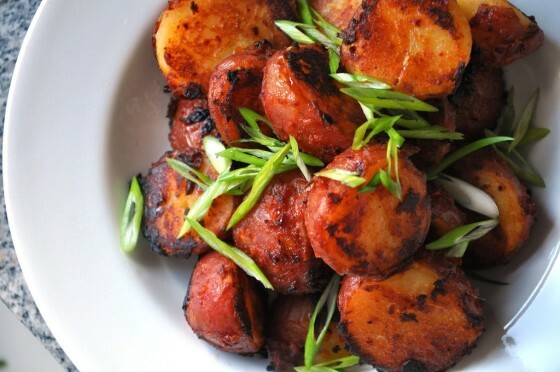 When tossed with parboiled potatoes and roasted, the doenjang forms a deliciously caramelized, crusty exterior. Although this is a rather crude comparison, they are not unlike a grown up version of addictively seasoned curly fries, guaranteed to get you hooked after the first taste. 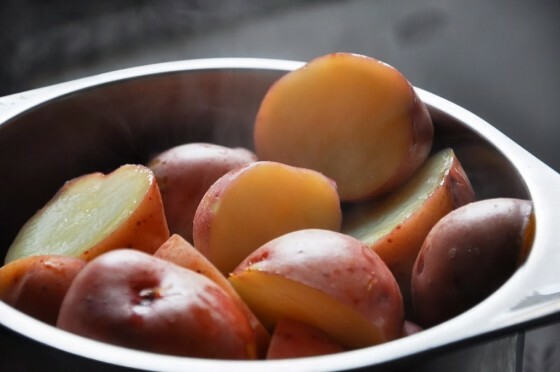 Don’t be shy when tossing the potatoes with the doenjang, the goal is to rough up the edges of the potatoes and get some of the potato starch and doenjang to form a coating on the outside that will crisp up in the oven. Steam the potatoes. Preheat the oven to 450⁰F. Meanwhile, fill a pot with a ½-inch of water and bring to a simmer. 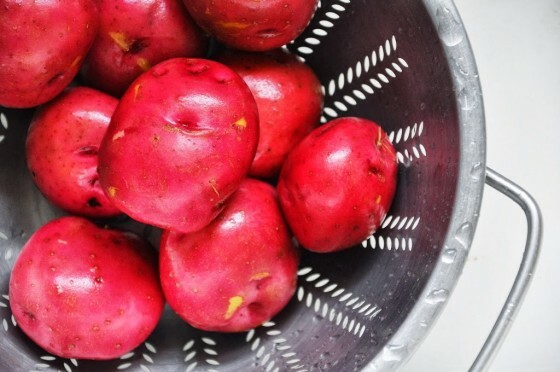 Place the potatoes in a steamer basket over the water and cook for 10 minutes, until a knife goes through with only a little resistance; dump into a large mixing bowl. Season the potatoes. Coat a heavy bottomed sheet pan (thin pans can lead to scorching) with two tablespoons of oil and allow to preheat in the oven for 5 minutes. 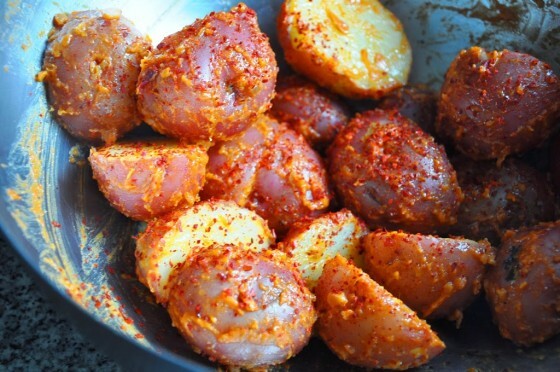 To the potatoes, add the doenjang, red pepper flakes, and the remaining tablespoon of oil. 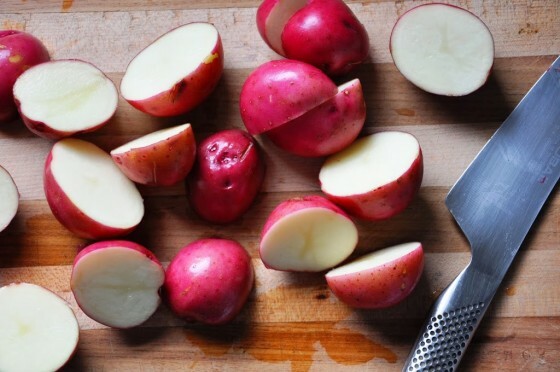 Toss the potatoes vigorously for 2 minutes, until there is a thick, starchy coating on the outside. Roast the potatoes. Place the potatoes cut side down and evenly spaced on the preheated, oiled baking sheet. 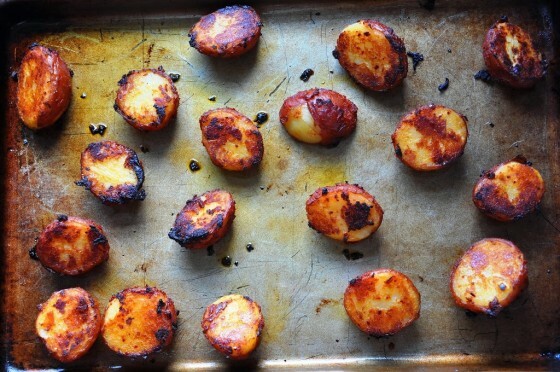 Roast for 15 minutes, then slide a thin metal spatula underneath the potatoes while pressing down on the baking sheet, so as to not rip off any crust on the potatoes, and redistribute cut side down again. Cook for another 10-15 minutes until the bottoms are well browned and crusty. 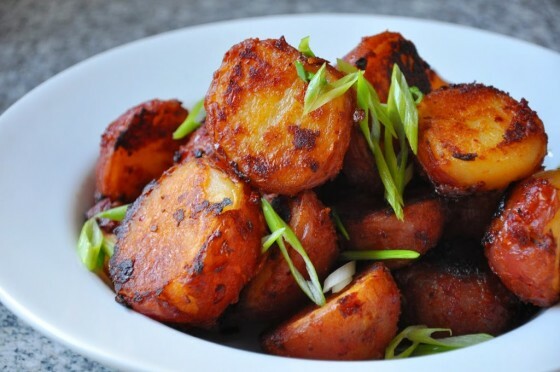 Flip the potatoes over and cook for another 10 minutes until crusty all over. Remove to a platter and sprinkle with the green onions; serve hot. Receive email notifications of follow-up comments. Or subscribe without commenting.